Manchester United may want to take note of rumoured managerial candidate Zinedine Zidane being apparently approached by Paris Saint-Germain. Despite only appointing a new manager this summer, with Thomas Tuchel coming in to replace Unai Emery, it seems PSG are keen to have Zidane in the dugout in the near future. CaughtOffside understands Zidane is confident he could be offered the United job soon after the poor start to this season made by Jose Mourinho, and that he’s communicated this to the club’s French players Paul Pogba and Anthony Martial. 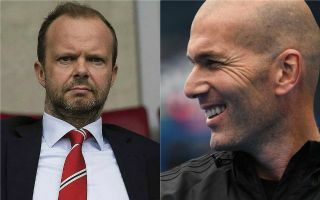 The Daily Mirror have also claimed the 46-year-old former Real Madrid boss is on ‘standby’ with United, but they might not have much longer to make up their mind about hiring the three-time Champions League winner. According to Don Balon, reporting on journalist Eduardo Inda’s claims to El Chiringuito, Zidane has already spoken with PSG, who would be keen to bring him in next season. It’s added, however, that this may depend on how Tuchel does in his first season in charge at the Parc des Princes. Zidane himself has perhaps also suggested he may be keen to return to coaching sooner than that anyway. “I am sure that I will coach again before long,” he was quoted by Marca. Zidane was a big success at Real Madrid and seems an obvious candidate for a big club looking to make the step up in the Champions League. PSG may therefore be a more suitable role for the Frenchman than United, who look more in need of a major rebuilding job after a difficult few years. It is, however, somewhat surprising to see PSG being linked with making moves to appoint a new manager so early on in Tuchel’s reign.